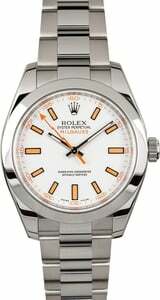 Comments: This certified pre owned Rolex comes with Bob's 3-day satisfaction guarantee and one year warranty. Temporary master photo. All side views are of actual watch and magnify 10x. The Milgauss is a member of Rolex's professional series of watches, which were developed to cater to various professions. The Milgauss is one of the more modest options in the collection, offering a smooth bezel, a time-only dial, and a stainless steel finish. Within the case, lies a soft iron Faraday cage, which surrounds the movement and protects it from high magnetic fields. 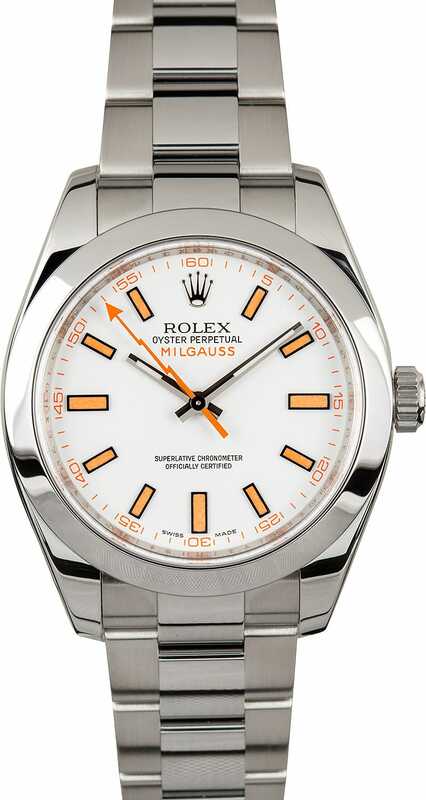 As its name suggests, the Milgauss is resistant to up to 1,000 gauss. The incredible anti-magnetism of the Milgauss is displayed on the dial via a bold orange lighting bolt and matching baton and 5-minute markers. As a newer used Rolex, the case also utilizes 904L Oystersteel, a scratch-resistant sapphire crystal, and a COSC certified calibre 3135 perpetual movement. Received by watch within a few days of ordering and it looks great. Bob's did a good job cleaning it up. I can't tell it's pre-owned.